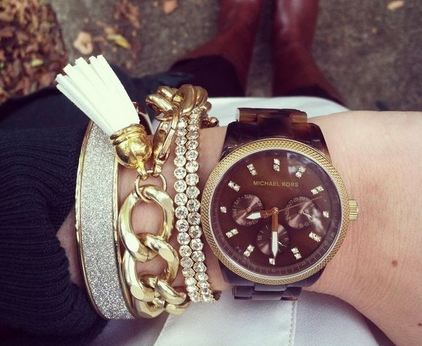 No matter the season, arm candies are always “in”. Though the term “Arm Candy” is typically defined as an attractive companion, what I’m referring to here are the “Arm Swags” aka accessories that we use to “decorate” our wrist. My personal “Arm Candy” favorite happens to be a statement watch. Aside for its obvious practical use, a great watch can be just what you need to complement a stylish outfit. What’s more is that there’s simply endless possibilities when it comes to stylishly stacking and layering your wrist! You can even get creative and have even more fun by matching your nail color into the mix! Curious as to how you can achieve a chic arm candy look? Let’s start off by picking the right watch. It is “the star” of the stage that is your wrist. Pick a watch that best resonates with you and your genuine style. Though watches with leather or tortoise or metal straps are best, to keep the look chic and polished, it’s probably best to stay clear of plastic watches. If you’re looking to add a touch of masculinity into your outfit, you can also use a nice chunky, oversized “boyfriend” watch. But do bear in mind to not go overboard on the size of the watch especially if you have a slim wrist as it can look overwhelming and sloppy. 1) Use 1 (one) main color as your base – or colors of the same palette (this includes your nail color too). Using several different colors would also work but try to steer clear from using too many as it can come across as juvenile. 2) Mix different styles of bracelets – You can blend all types of bracelets (i.e: metals, pearls, jewels, rhinestones, beads etc.) but it’s best to keep them relatively the same. Do place the “boldest” bracelet furthest away from the watch and build your other bracelets around the bulkier, standout piece. 3) Pick pieces with similar characteristics – Refer to the image below (gold, “bling”, sparkle). Stack your go-to watch with your favorite “bling” for a show-stopping Arm Party!